Place the flour, salt, and hazelnuts in the bowl of a food processor. Pulse to combine. Add the butter pieces and pulse until the mixture looks like coarse cornmeal. Add the egg and pulse until the mixture just begins to form a ball. Do not over mix or it will make a tough crust. Turn out onto a worktable and then knead lightly, then form a disk. Wrap in plastic and refrigerate at least 1 hour. After chilling, place on a lightly floured worktable and roll out to fit the 10-inch tart pan. Line the pan, trimming to fit. Refrigerate for at least one hour. Line the tart dough with foil and place baking beans or pie weights in the pan. Bake in a 350°F oven for about 10 minutes or until the edges just begin to color. Remove the beans and the foil. Place the tart shell back in the oven and bake for 4-5 more minutes. Remove from the oven and cool slightly. 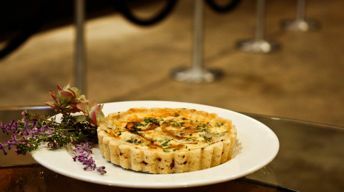 Place the tart on a baking sheet and spread the crumbled stilton and caramelized onions evenly in the bottom of the tart shell. Then pour the egg mixture over the cheese. Put the tart in the oven and bake 20-25 minutes or until the eggs are lightly browned and set. The mixture will puff up. Remove from the oven and cool before cutting. In sauce pan carmelize onions over medium heat.